Who can remember high-heel workouts? For the past ten years or so, we’ve been told a lot about the benefits of exercising in high heels. In fact, research suggests that our calves can be shaped, as well as muscle tone and shape improved just be walking in high heels which are under three inches. Wear high heels when squatting, lifting small weights or lunging and it’s also said your balance can be improved. While there are no accurate findings to suggest that workouts in high heels can help with weight loss yet, these exercises will at least help you to walk better in the footwear! Remember to do a proper cool down to help manage pain in the back or joints that might arise after a work out! Who can remember barefoot jogging? It was in 2010 that a selection of runners started to feel the benefits of wearing a form of running ‘sock’ as opposed to their go-to running shoes. Supporters of barefoot jogging claim that choosing to run in trainers or shoes can leave you more vulnerable to injuries, due to the footwear forcing you into unnatural form. On the flip side, barefoot running can strengthen the tiny muscles based in our feet, ankles and legs — reducing the chance of injury in the process. We may not be seeing as many people jogging barefoot as they were during the early years of the past decade. However, a number of runners still stand firmly behind the trend. Just be sure to give barefoot walking a go before progressing into a jog or run — as it can be an unusual transition at first. Who can remember ‘hot barre’? ‘Hot barre’ first became a popular fitness trend throughout the American cities of Los Angeles and New York. Really taking off around 2015, the fad involved groups performing classical ballet moves in a room that was heated to 40 degrees. According to supporters of the trend, ‘hot barre’ helps your body to release toxins, enables you to feel detoxed and provides you with a deeper stretch. Your metabolism can also experience a boost when your body is having to work harder in order to cool itself down — a process that will increase the number of calories being burnt too. Who’s getting involved in plogging? Plogging has only been gathering momentum over the past few months and yet is already gaining quite a following. The Scandinavian-based fad is different in that it gives fitness lovers the incentive to pick up litter as they are on a run, in a process that improves your health and benefits the environment too. 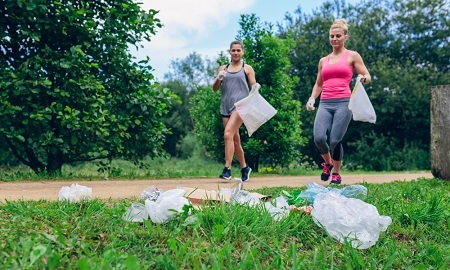 There’s plenty of exercise involved in plogging, as you’re not only running but also performing intermittent squatting and lunging as you collect rubbish off the ground. It’s definitely one to think about if you’re looking to burn off some calories as well, due to fitness app Lifesum estimating that one of their typical users will burn 288 calories during just 30 minutes of plogging. Just in case you’re wondering too, the word plogging is a combination of the word jogging and a Swedish phrase ‘plocka upp’, which translates to pick up. Any guesses what the next fitness fad — whether strange or revolutionary — will be in the world of exercise?